The War Resisters League is standing with other organizations and communities to mark eight years of war and destruction in Afghanistan, to say no to war and torture, and to call on the Obama administration to listen to the Afghan people, to surge peace and development and justice, not war and troops. Our National Office is located in lower Manhattan, and we were there on September 11, 2001 when two planes flew into two buildings and resulted in the deaths of 2,603 people in New York City (and a total of 2,974 when deaths in Pennsylvania and at the Pentagon are included). But in the midst of fear and unknowing, we were able to hold on to what has kept us anchored since 1923-- this bedrock belief that war is never the answer. As we marched on October 7, 2001, President George W. Bush addressed the American public, saying: "As we strike military targets, we will also drop food, medicine and supplies to the starving and suffering men, women and children of Afghanistan… The United States of America is a friend to the Afghan people." The War Resisters League knew that was a lie then. And the last eight years has only deepened our commitment to nonviolence and to the social and political change that comes from people working together, struggling together and listening to one another. What is happening in Afghanistan right now is not peace and development and liberation for the burka-ed women. It is war: it is war begun in vengeance and desperation and continued out of the reprehensible notion that right can come out of wrong. It is impossible to get an accurate or complete count of the number of deaths caused by U.S.-led military operations in Afghanistan, but the estimates run in the tens of thousands, and the security situation continues to be bleak and precarious for the people President Bush promised to stand with eight years ago. This $100 million-a-day fiasco has led to the deaths of 1,103 Afghans—by one conservative estimate—just in the first six months of 2009. So far, “Operation Enduring Freedom” has cost the United States $223 billion, according to Congressional Research Service. This is a fraction of what the war in Iraq has cost, but analysts are estimating decades more of significant military presence in Afghanistan and ongoing high (and rising) costs. Stephen Biddle with the Council on Foreign Relations says the United States “will need a large combat presence for many years to come and we will probably need a large financial commitment longer than that.” Bing West, who worked in President Ronald Reagan's Pentagon, puts a dollar figure on that “commitment” saying that the United States will need to allocate $4 billion a year for Afghan forces and another $4 billion for development projects far into the future. As of September 1, 2009, 734 U.S. military personnel have been killed in the Afghanistan theater (including deaths in Pakistan and Uzbekistan) since 2001. August was the deadliest month for U.S. military personnel since the Taliban was ousted in late 2001. The war comes back to us. Not just in the deaths of American soldiers and contractors but in the torture and abuse and mistreatment of those so called “enemy combatants” held at Bagram Air Base in Afghanistan, in Guantanamo and at other sites throughout the world. When he took office, President Obama pledged to break with the Bush administration’s illegal and immoral practices. But in the months that followed, he has done nothing to bring justice or reparations (or even criminal charges) to those thousands held, he has not held the architects and perpetrators of torture and terror tactics accountable (the belated decision to appoint a “special prosecutor” seems calculated to placate those critical of his record without changing anything). The United States’ torture and terror tactics do more than just wound and maim and damage the men we torture… our nation is stained and tainted as a result of these practices. On Monday, October 5th, the War Resisters League will once again stand with the victims of war, the Afghan people, the Pakistani people, those who have been tortured. We will be in Washington, DC to protest President Obama’s continuation of some of the worst of the Bush administration, the war in Afghanistan. This was originally posted to the Offbase Myspace Page, June 15, 2009. The Virginia-based GI coffeehouse and activist center, Norfolk OffBase has become an affiliate of the War Resisters League, an 86 year-old pacifist organization advocating for the end to war and violence. In keeping with WRL’s mission, the Virginia group is dedicated to challenging militarism, advocating for GI rights, and educating for peace. War Resisters League sees Norfolk OffBase’s efforts as an integral part of the GI resistance movement, the support of which is one of WRL’s program areas. “The opportunity for veterans to come together and acknowledge their experience is crucial to understanding war and is imperative in the struggle to end it,” War Resisters League Program Associate Jenessa Stark said. Their space, Norfolk OffBase, 2501 Fawn St in Norfolk “provides a safe environment for community activists to come together with active duty service members and newly discharged GIs to engage in dialogue and support,” Stark continued. In May, OffBase initiated a series of events and actions in response to a call for a “Summer of Solidarity.” The coffeehouse planned and offered educational forums, speakers, actions and advocacy focused on global peace, social justice, workers rights, environmental stewardship and affordable healthcare for all. Additionally, War Resisters League has endorsed OffBase’s June hallmark event, "The Road to No War!" a 5 day, 53 mile peace march to various military sites in Hampton Roads. Dedicated on Veterans Day in 2008, Norfolk OffBase is a non-commercial, secular, non-profit convergence space which has freely hosted events for GI's, veterans and the greater community. The WRL affiliate will be holding public meetings at 7:00 pm each first and third Thursday of the month at 2501 Fawn St. Active duty, veterans and supporters are encouraged to contact the War Resisters League via email at wrl@warresisters.org or by calling 212-228-0450. Alternatively they can contact Norfolk OffBase directly by email at NorfolkOffBase@gmail.com or by calling director Tom Palumbo at 757-470-9797. At 18, Fabian Bouthillette joined the Navy. In his words, he wanted to “do something good and decent.” He served for several years, but then as the Iraq War began and raged on, he found what he was doing was for all the wrong reasons. Bouthillette, now 27, found the antiwar group Iraq Veterans Against the War through an Internet search for “Veterans for Peace.” He connected with the mission of the group, as part of which he is now fighting to end military support for the war and to broaden outreach to local veterans. For the past three years, Bouthillette, who lives on the Lower East Side, has studied the antiwar movement and Vietnam-era activism. “I went from a very innocent, young Navy officer to becoming a veteran in the antiwar movement, instead of a veteran of the Navy,” he reflected recently during an interview at the Bluestockings Bookstore and Cafe on Allen St., near his home. Now, Bouthillette is the secretary and outreach coordinator for Iraq Veterans Against the War’s New York chapter, which shares space with the War Resisters’ League in Noho, at 339 Lafayette St.
I.V.A.W. was founded in 2004, by a group of Iraq War soldiers who were united in their opposition to the conflict. They were no longer willing to remain silent about their experiences or their desire to see the war end. The group’s second-floor office is reached by climbing a dark, cramped staircase. The narrow hall is littered with tacked-up fliers and old posters. It opens to a cluttered, sunlit space. “You walk in there and you feel like you’re in the ’60s protesting Vietnam,” Bouthillette said. I.V.A.W. offers support to fellow soldiers and provides a forum to those willing to talk about their experiences. “It’s not about being anti-military. It’s just about being anti-occupation,” he explained. Army Captain Luis Carlos Montalván served two combat tours in Iraq. He joined I.V.A.W. because he said no other organization was as genuine in its commitment to extricating the United States from Iraq. “Too many irresponsible acts by utterly loathsome politicians and military leaders have caused our national woes for the past eight years,” Montalván said. He said I.V.A.W. veterans have a shared understanding that foreign policy changes need to be made. The organization sponsors Winter Soldiers, a speakers panel of Iraq and Afghanistan war veterans, in which Montalván has been a participant. The group collects testimony and talks to the public about day-to-day life on the ground, for soldiers and civilians, in these war zones. Once a month, I.V.A.W. heads out to local armories. Bouthillette said their presence lets soldiers know there is an active antiwar movement led by veterans. They hand out fliers and try to talk about the war. .V.A.W. has built up a network of local therapists offering free mental health services. Bouthillette grew up in Arlington, Va., about a mile from the Pentagon. He graduated high school in the late 1990s and promptly enrolled in the Naval Academy in Annapolis, Md., to get a good education. “I’m a guy who grew up poor. It was just that simple,” he said of his joining the military. He graduated from the Naval Academy in 2003, with a five-year commitment. But in a strange twist of fate, the Navy commissioned too many officers, and in November 2004, it requested volunteers to waive their active-duty requirement. Still, there are elements of the military that Bouthillette misses. “You’re just part of a huge community that works really hard together,” he said. He remembers navigating the U.S.S. Curtis Wilbur, a guided-missile destroyer, in the Sea of Japan. “Just looking at that alone — not why we were doing it or the political reasons — was awesome,” he said. “And, I will never do that again. I’ll never be the officer on deck on a warship. “One second I am an officer in the Navy and next second I am just an unemployed guy,” he said, recalling his retirement from active duty. He walked off the base, took off his uniform and got into a friend’s car. “That was it. I was happy, but it was weird. The best thing that could happen is that the war just ends, Bouthillette said. When Private Jeremy Hinzman crossed the border into Canada in January 2004, he became the first AWOL GI to seek refugee status there. The U.S. Army had denied his request to serve in a non-combat role as a Conscientious Objector. They forced him into a tour in Afghanistan, and then ordered him to deploy to Iraq. Four years after fleeing the country, Hinzman, his wife and one-year-old son are facing the possibility of deportation back to the United States. In March 2005 Canada’s Immigration and Refugee Board denied Hinzman’s refugee claim. Notoriously conservative in its determinations, the Refugee Board refused to consider the illegality of the Iraq War and declared that the court-martial and imprisonment that awaited Hinzman in the U.S. did not amount to “persecution” for his political beliefs. Brandon Hughey, the second AWOL GI to seek refuge in Canada, was also denied refugee status, as have at least a dozen other U.S. war resisters—and counting. Although Canada has never granted refugee status to anyone fleeing persecution in the United States, Hinzman, Hughey, and their Canadian supporters continued undaunted in their quest for political refugee status. Their lawyer, Vietnam War resister Jeffry House, appealed in Canada’s Federal Courts, eventually going all the way to the Supreme Court. But on November 15, 2007 the Supreme Court of Canada announced that it would not hear the war resisters’ appeals. The war resisters’ political strategy bore its first fruit last December 6 in Canada’s House of Commons. After hearing eloquent testimony from former U.S. Army Sergeant Phillip McDowell, along with representatives of the Mennonites and Quakers, the Standing Committee on Citizenship and Immigration adopted a motion calling on the government to allow war resisters to stay in Canada. The motion, which also calls for a halt to deportation proceedings, passed by a 7-4 vote, with all of the opposition parties united against the ruling Conservatives. The Committee’s motion, which was broadened to include resisters of all wars not sanctioned by the UN, reads as follows: “The Committee recommends that the government immediately implement a program to allow conscientious objectors and their immediate family members (partners and dependents), who have refused or left military service related to a war not sanctioned by the United Nations and do not have a criminal record, to apply for permanent resident status and remain in Canada; and that the government should immediately cease any removal or deportation actions that may have already com- menced against such individuals. The passage of this motion was the first good news they had received in some time. “This shows a willingness of the opposition parties in Canada’s Parliament to come together to ensure that none of these resisters is returned to the U.S. where they face court martials, incarceration, and possible deployment to Iraq,” said Zaslofsky. “What we need,” continued Zaslofsky, “is for the Liberal Party as a whole to take a stance on this. Together (the three parties) have a majority and if they act together they can put something through the House of Commons. Coming only weeks after the disappointing decision by the Supreme Court, the Committee’s affirmative vote felt like a miracle. But it was no fluke. For four years the War Resisters Support Campaign, comprised of unions, churches, artists, and activists, has been organizing across Canada with the slogan “Let Them Stay.” The war resisters themselves have spoken hundreds of times, collectively, in community meetings and in the media. U.S. war resisters in Canada are very encouraged by this showing of popular and parliamentary support. The Committee’s motion must now be put before the entire House of Commons where it is hoped that the opposition parties will once again unite to pass it. In the meantime, Jeremy Hinzman has received his Pre-Removal Risk Assessment. His case is being reviewed and within months he may be given an order to leave Canada. On yet another track, Hinzman is appealing to the Immigration Minister to allow him to remain in Canada on “Humanitarian and Compassionate” grounds, along with his wife, Nga Nguyen, and their son, Liam, now five, who has spent most of his life in Canada. Hart and fellow resisters Robin Long and Corey Glass have all received their Pre-Removal Risk Assessments, a step toward deportation. While a majority of Conservative party voters in the Ontario poll were sympathetic to the plight of U.S. war resisters, that is not the position of the minority Conservative government. In 2003, Stephen Harper, Canada’s current prime minister, was a vocal proponent of Canada joining the U.S. war against Iraq. Fortunately, a sizable majority of the Canadian people saw things differently and the Liberal government at the time declined President Bush’s invitation to join the “Coalition of the Willing.” Harper now denies he ever supported the Iraq War. But Canada’s Conservative prime minister is an ardent advocate for the U.S.-initiated war in Afghansistan, where Canadian soldiers are an important part of the NATO deployment. The previous Liberal government first sent troops to Afghanistan in 2001 and Harper’s Conservatives have extended that mission until February 2009 and are pursuing an additional extension, while exhorting the European members of NATO to send additional troops. With more and more Canadian troops dying in Afghanistan, and a scandal raging over the torture of prisoners captured by Canadians and handed over to Afghan (and possibly U.S.) forces, the majority of Canadians are against this war. In fact, opposition to the Afghanistan War may be a major factor in forcing a federal election, possibly as early as this spring. Ultimately, it may take a change at the top of the Canadian government to ensure a safe haven for war resisters. With the Liberal Party in disarray, however, progressive Canadians worry that the Conservatives might return to power. So it was with a mixture of optimism and urgency that the War Resisters Support Campaign organized a “pan-Canadian” day of action on Saturday, January 26, two days before the Parliament would reconvene. Events were held in at least 11 Canadian cities—from Victoria, British Columbia to Halifax, Nova Scotia. People listened to speeches, watched antiwar films, and wrote letters to government officials and party leaders. In several cities, they marched to the post office and made a show of mailing the letters. In Toronto, the Bloor Street United Church filled up with hundreds of supporters. When Jeremy Hinzman was introduced, the crowd greeted him with a prolonged standing ovation. He then reminded listeners of the reasons he came to Canada in the first place and thanked the Canadian people for their tremendous support. In the U.S., the war resister advocacy group Courage To Resist coordinated solidarity actions on Friday, January 25 to coincide with the pan-Canadian actions. Vigils were held outside Canadian Consulates in New York, Philadelphia, Minneapolis, Dallas, Los Angeles, San Francisco, Seattle, and at the Canadian Embassy in Washington, DC. Delegations met with Consular officials and delivered copies of thousands of names of people in the U.S. who have signed petitions and letters to the Canadian government. Significantly, the January 25 vigils and delegations were the first nationally coordinated actions in the U.S. in support of our war resisters in Canada. Groups that joined Courage to Resist and the War Resisters Support Campaign in making this a successful day included Interfaith Communities United for Justice and Peace, War Resisters League, Iraq Veterans Against the War, DECOI, Veterans for Peace, Raging Grannies, Project Safe Haven, Twin Cities Peace Campaign, Truth in Recruiting, Payday men’s network, Global Women’s Strike, North Texas for Justice and Peace, United for Peace and Justice, and others. United For Peace and Justice promoted these actions via email to its entire national membership. Iraq Veterans Against the War (IVAW) did the same, and IVAW members were front and center at many of the vigils around the country. Many of the resisters are, of course, also Iraq veterans themselves. They survived one tour but went AWOL when ordered back a second time. IVAW members have made several trips to Canada to visit their fellow veterans and they are making arrangements for some of them to testify via satellite television at the Winter Soldier hearings being organized for March 13-16 in Washington, DC. Iraq veterans are also mobilizing members and supporters to reach out to active duty GI’s, including at Fort Lewis, Washington. Estimates of the number of U.S. war resisters in Canada range from 200-300. Approximately 50 of them have applied for refugee status. AWOL GIs continue to make the trek north. They can still enter Canada as visitors and then apply for refugee status, which gives them immediate legal status in Canada as long as their refugee claim is pending, possibly a year or more. Refugee claimants are eligible for social assistance in some provinces and for Canada’s free national healthcare. War resisters thinking of coming to Canada are advised to call the War Resisters Support Campaign so that Canadian supporters know they are on their way. This is increasingly important because Canadian border guards at some points of entry are reportedly profiling AWOL soldiers and discouraging them from entering, even putting them on the phone with their commanding officers. In such a case, a war resister can claim refugee status right at the border, and the Canadian authorities will respect this. Otherwise, it is preferable to enter Canada and see a Canadian lawyer before making a refugee claim. Some AWOL GIs may actually be eligible to be discharged from the military without further punishment, and experienced counselors can help them do that. Such an outcome is arguably preferable to an uncertain future in Canada without the ability to travel home to the U.S. to visit family or friends. In case Canada does deport war resisters back to the U.S., the antiwar movement must be prepared to defend them, legally and politically. Some might call it amnesty. Some might call it justice or human rights or solidarity. The bottom line is that nobody should be punished for refusing to fight in an unjust war. By energetically supporting all war resisters, we can help bring an end to the U.S. wars in Iraq and Afghanistan and make it more difficult to launch such wars in the future. That should be our goal. 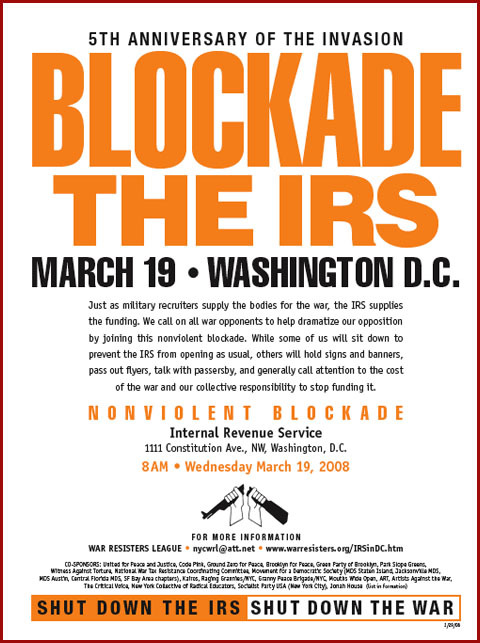 On March 19, 2008, we will set up a nonviolent blockade of the national Internal Revenue Service headquarters in Washington, DC, as part of the day of actions against the wars in Iraq and Afghanistan. Just as military recruiters supply the bodies for the war, the IRS supplies the funding. Just as some soldiers have the courage to resist the war, we — as tax payers — should have the courage to resist paying the taxes that send soldiers to war. We call on all war opponents to help dramatize our opposition and to disrupt business as usual by joining this nonviolent blockade. For at least this one day — March 19, 2008 — we need to create a disturbance in the smug complacency of the IRS/Pentagon money-axis. We will gather in our affinity groups at 7:30 am on Wednesday morning, March 19, at McPherson Sq., 15th & K St. NW. From these areas we will march to the IRS main entrance at 1111 Constitution Ave. (between 10th & 12th Streets), NW, and across from the Smithsonian’s Museum of Natural History. Once at the entrance, some of us will sit down to prevent the IRS from opening as usual, while others will hold signs and banners, pass out flyers, talk with passersby, and generally call attention to the cost of the war and our collective responsibility to stop funding it. Ralph DiGia, World War II conscientious objector, lifelong pacifist and social justice activist, and staffer for 52 years at the War Resisters League (WRL), died February 1 in New York City. He was 93. DiGia was "without pretensions, one who wore his radicalism in his life, not on his sleeve," said his long-time WRL colleague David McReynolds. In addition to his decades at WRL, DiGia's activism took him through countless arrests and a stretch in federal prison, thousands of meetings and hundreds of demonstrations, hunger strikes, a bicycle ride across Europe, relief work in Bosnia, and not a few New York Mets baseball games. 80 Years of Activism. Born in the Bronx to a family of Italian immigrants in 1914, DiGia grew up on Manhattan's Upper West Side. A 1927 rally for Italian anarchists Nicola Sacco and Bartolomeo Vanzetti set him on the path he would follow for 80 years. At the College of the City of New York, where he was studying bookkeeping, DiGia signed the "Oxford Pledge," refusing to participate in the coming war. In 1942, when the Selective Service System ordered him to report for induction, he said he was a conscientious objector. But his objections to war were based on ethics, not religion, and the draft board had no category for secular COs. The U.S. attorney's office referred him to pacifist lawyer Julian Cornell, at the War Resisters League; Cornell lost his case, and DiGia spent the next three years in federal prisons. In 1955 he joined the WRL staff as a bookkeeper. In the early 1960s, he was arrested more than once for not taking shelter during "civil defense" drills. In 1964 he served four weeks in jail in Albany, Georgia (with, among others, the late peace theorist Barbara Deming) in the Quebec-Washington-Guantanamo Peace Walk organized by the Committee for Nonviolent Action. As the Vietnam War escalated, so did the WRL--and DiGia's--resistance. He sent out literature, paid bills, and kept records--and organized demonstrations and counseled draft resisters. In 1971--when he was among 13,500 arrested in the May Day antiwar actions in Washington-- he married Karin, becoming stepfather to her children. Their son Danny was born in 1973. He kept resisting war and militarism. In 1977, when thousands protested nuclear power at Seabrook in New Hampshire, he was there. A year later he was arrested on the White House lawn, demanding nuclear disarmament. He was in Central Park in June 1982 when a million people said "No Nukes!" He was at dozens of demonstrations at the United Nations. In the early 1990s, as the tensions in former Yugoslavia turned deadlier, Karin DiGia transformed Children in Crisis, a nonprofit she had founded in the 1970s to address the issue of missing children, into a Bosnian relief agency. The work involved traveling several times a year to Bosnia and to Germany, where the agency also had headquarters. DiGia often accompanied her, becoming as beloved a figure in Bosnia as he was in New York. Into his 80s, DiGia kept accumulating a record: He was arrested in Washington at WRL's "A Day Without the Pentagon" in 1998 and--possibly for the last time--at the mass protests against the acquittal of the NYPD officers who shot Guinean immigrant Amadou Diallo in 1999. He continued his work at the WRL office through his 93rd birthday last December, although he had become a volunteer instead of a paid staffer in 1994. He even lived out his activism in the ball park: An ardent Mets fan, he remained seated--on principle--during the national anthem. In 1996, the Peace Abbey, the multi-faith retreat center in Sherburne, MA, gave Ralph its Courage of Conscience award (previously given to civil rights activist Rosa Parks, poet Maya Angelou, and the Dalai Lama), "for his example as a conscientious objector and for over forty years of dedicated service at the War Resisters League." In 2005, WRL gave its 40th annual Peace Award to DiGia and his longtime colleague, former photographer Karl Bissinger. This winter, after a fall and hip fracture, he developed pneumonia and died Friday in St. Vincent's Hospital. Karin and their children were with him when he died. DiGia is survived by Karin DiGia, his wife of 37 years; their children, Howard, David, Brenda, Melissa and Daniel, his granddaughter Kyla, and his brothers, Robert and Mario. Contributions in his memory may be made to the War Resisters League.